The Soviet occupation of Bessarabia in 1940 guaranteed that if Romania saw a chance to grab the province back, the Armata Romana would be on the move against the Red Army. The government that returned the lost province to the kingdom would instantly become extremely popular, and most Romanian officers burned to avenge their country’s humiliation. The result was Romania’s participation as part of the Axis in the June 1941 attack on the Soviet Union known as Operation Barbarossa. And their particular goal was the liberation of Kishinev (Chisinau in Romanian). Romania’s commitment to Operation Barbarossa included the recovery of Bessarabia, but nothing more. Today making up most of the independent Republic of Moldova, Bessarabia had been taken by the Russians from Turkey in 1812 and seized by the Romanians in 1919 during the chaos attending the Russian Revolution. The elite Cavalry and Mountain Corps would join the German 11th Army in clearing the northern segment of the province, while the V Corps forced a crossing at Falciu. The thrust toward Kishinev, the province’s capital, would be in the hands of Maj. Gen. Vasile Atanasiu’s III Corps. V Corps had the Armata Romana’s best infantry divisions (the Guard and 21st); 11th Army had the services of the crack cavalry and mountain brigades plus the lone Romanian armored division. III Corps entered combat with only average units, though enthusiasm for the so-called “Holy War” against the Bolsheviks still had currency in these early days of the war. A Romanian Army handbook’s diagram of the Skoda 150mm howitzer. Very few of these modern guns were present at Kishinev. 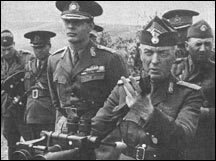 The actual battle opened in the late afternoon of 2 July 1941, when the Romanian 35th Reserve Division ferried two battalions of the 67th Infantry Regiment over the river while Romania’s Conducator, Gen. Ion Antonescu, along with young King Michael, looked on. The operation went well, with just one man killed in the brief skirmish to scare off the NKVD border guards protecting the crossing. Not much else would come easily for the hapless 35th. During the night, the 6th Danube Bridge Engineer Company threw a pontoon span over the Prut very quickly and efficiently (Romanian bridge engineers would earn high marks throughout the 1941 campaign). The rest of the 67th, all of the 55th Infantry Regiment and the division’s artillery crossed, and secured a bridgehead. So far, things were going well. Atanasiu sent his 15th Infantry Division across the river on the 4th over its own bridges, widening the bridgehead and awaiting the Soviet response. It came the next day. Atanasiu’s caution, reinforced by the Romanian 4th Army’s commander, Nicolae Ciuperca, came from Romanian intelligence reports indicating that the Soviet 9th Army, responsible for the southern segment of Bessarabia, contained some of the Red Army’s best formations. And so it did — the 74th Rifle Division and both divisions of 2nd Cavalry Corps were considered elite, and the 95th Rifle Division was also very good. The Romanians credited the Soviets with two tank brigades, apparently unaware that these had been raised to division strength during the previous spring. Aided by a friendly civilian population, the Romanian assessment was far more accurate than that of the laughably incompetent German “Foreign Armies East” department, and it gave Atanasiu and Ciuperca pause. Neither general could fathom why the Red Army did not strike immediately. King and Conducator watch the 67th Infantry Regiment cross the Prut, 2 July 1941. 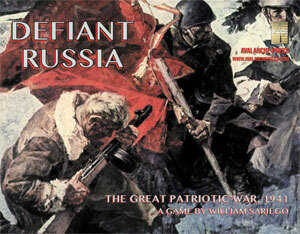 The answer lay in the general paralysis of the Soviet command structure following the German sneak attack. 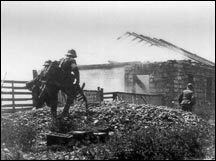 Shaken by the German assault’s speed, Southwestern Front requested permission to pull back to the Stalin Line fortifications along the pre-1940 border. Ninth Army, a separate command from Southwestern Front, awaited the reaction of its northern neighbor before committing its own troops. After a delay of several days, the STAVKA rejected the retreat option, ordering 9th Army and 18th Army on its right flank to attack at once and regain the Prut line. In response, 95th Rifle and the cavalry corps probed both flanks of 15th Infantry Division on the morning of 5 July, and hit 35th Reserve Division head-on. All of the Romanian units held their positions. On the 6th, 11th Infantry Division crossed the Prut and entered the line south of 15th Infantry. Atanasiu ordered all three divisions to advance on the next day. Eleventh Infantry moved up the Cornesti Heights against stiff opposition, 15th Infantry against less. And 35th Reserve met nearly fanatic resistance. The reservists suffered disaster when a Soviet tank-infantry task force routed 67th Infantry Regiment and caught the division’s 63rd Artillery Regiment on the move. The gunners tried to unlimber their outdated 75mm field guns to fight the tanks at point-blank range, with only mixed results. Wielding a light machine gun slung over his arm, the divisional artillery commander was wounded and both of his battalion commanders killed leading the defense. All of the 63rd’s guns were lost, as well as two 155mm batteries of the 55th Motorized Heavy Artillery Battalion — irreplaceable modern weapons in very short supply in the Armata Romana. Shorn of most of its artillery support, having lost over 2,200 prisoners in just a few hours’ fighting, Brig. Gen. Emil Procopiescu’s division was crumbling rapidly. With some bitterness, Antonescu formally requested German assistance, and the German 72nd Infantry Division took over 35th Reserve’s sector. Ciuperca ordered the corps over to the defensive while reinforcements came up, and two elite formations arrived over the next two days – 7th Cavalry Brigade and the Frontier Guard Division. Bloody fighting continued on the heights, as the Soviets repeatedly tried to throw the Romanians into the river. Romanian soldiers on the attack. On the 14th Atanasiu resumed the attack, while on his left flank the German 54th Corps committed its German 50th Infantry and Romanian 5th Infantry Divisions to an attack from the northern flank. Despite heavy counter-attacks, the Romanian-German offensive ground forward and the next day Ciuperca brought the Romanian Royal Armored Division into a breach opened by 54th Corps’ attack. The tankers penetrated deeply toward the capital, finally being stopped by a counter-attack by 47th Tank Division in a furious tank battle along the Orhei-Kishinev Highway. Atanasiu withdrew the remnants of 35th Reserve from the front lines; it was broken up and its remaining personnel used to replace losses in other combat divisions. Romanian soldiers on the attack. Again. Romanian tanks entered Kishinev in the early morning hours of the 16th, taking a number of Soviet units there by surprise. By nightfall the Red Army was retreating from the city, heading toward the Dnestr River bridge at Tighina on the border between Bessarabia and Ukraine. The entire Bessarabian campaign cost Romania 22,000 casualties, against 17,000 Soviets, but at the time most of the population supported what they saw as the liberation of national territory. 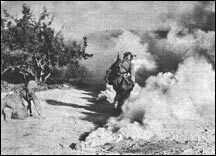 But on 3 August 1941 Romanian cavalrymen forced a crossing of the Dnester into the Soviet Union proper, as Antonescu acceded to Adolf Hitler’s request for active Romanian participation beyond the old frontier. A new war, massive casualties and national disaster awaited. Mike Bennighof is president of Avalanche Press and holds a doctorate in history from Emory University. A Fulbright Scholar and award-winning journalist, he has published over 100 books, games and articles on historical subjects. He lives in Birmingham, Alabama with his wife, three children and his dog, Leopold. Leopold barks at squirrels.